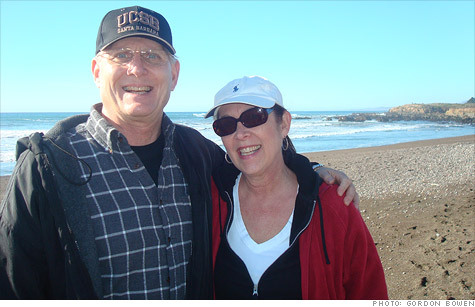 Gordon Bowen, with his wife Linda, had his wages frozen in 2007. He has not received a raise since then. NEW YORK (CNNMoney) -- Slashed health care coverage and frozen wages were the hallmark of the recession -- at least for those who held onto their jobs. Yet even though the economy has improved, many of the employee benefits that were once guarantees are starting to look like a thing of the past. Over the past five years, 40% of working adults have seen their employer-sponsored benefits reduced or eliminated entirely, according to a survey by the National Endowment for Financial Education, or NEFE. Harris Interactive conducted the survey on behalf of the nonprofit, polling 2,210 adults in the U.S. -- more than half of whom were employed. An overwhelming majority, or 72%, of those who saw their benefits cut said their health insurance coverage was hardest hit, NEFE said. As employers cut back, employees shouldered more costs, including higher deductibles and co-pays, as well as more expensive premiums. This year, workers' out-of-pocket costs rose 5.8% to an average of $3,470 for a typical family of four, according to data compiled by independent actuarial and health care consulting firm Milliman Inc.
By 2017, cost and competitive pressures are expected to prompt more than 50% of large Fortune 1000 organizations toward dropping health care coverage altogether, according to a recent study by the Corporate Executive Board, a Washington, D.C.-based research firm. Once those businesses have a viable alternative -- such as the insurance exchanges that enable workers to purchase their own insurance that are laid out in the Affordable Care Act -- then there are not a lot of reasons for them to continue to offer health care coverage, said Brian Kropp, a managing director at Corporate Executive Board. Almost two thirds, or 63%, of businesses said that if they dropped coverage, then they would offer employees cash to make up for at least some of the expected cost difference between employer-sponsored and exchange-purchased coverage, the Corporate Executive Board said. "The vast majority of organizations are better off taking those resources and offering employees something else, like more money or paid time off. You get a much bigger bang for your buck," Kropp said. But currently, most employees aren't getting those trade-offs. More than two out of every five workers, or 41%, have had their pay raises suspended and another 23% said their bosses stopped giving performance bonuses, NEFE's survey found. Not only are employees making less but saving for retirement and other expenses has gotten harder, too. One quarter, or 25%, of those surveyed by NEFE said their company cut back on their 401(k) match and 13% said their employer stopped matching altogether. Gordon Bowen, a professor at Mary Baldwin College in Staunton, Va., said his employer used to make a contribution to his retirement savings account that was equal to 7.5% of his income, but the college temporarily suspended that benefit in 2007. Around the same time, the private college froze his wages. Since then, Bowen says his retirement contribution has been reinstated at 3% of his annual income but he hasn't received a raise in 5 years. Three-quarters of the U.S. employers that suspended their 401(k) plan matching contributions during the economic downturn have since restored them, according to an analysis of 260 organizations by benefits consultant Towers Watson. However, many of them are now offering benefits at a lower rate. Bowen's wife Linda, a public school teacher in Virginia has had a similar experience. "The state has also chosen to use this climate of belt tightening to scale back all kinds of benefits," Bowen said. "It's been a good life, but it's being corroded by reckless disregard of the implications of year after year of wages freezes, not just for me but for my wife," said Bowen. "That's a sobering thing to deal with," said Ted Beck, NEFE's president and CEO. "But there's a tough love message in there, [American households] have to figure out how to do it on what they have."